Green Tabasco Sauce is something you’ll always find in my fridge, and I love the spicy flavor this adds to recipes! I’m not one of those people who likes blazing hot food that starts your mouth on fire, but I do like things with a bit of heat. If I’m adding sizzle to a recipe, my spicy sauce of choice will be either Sriracha sauce, or this jalapeno-flavored Green Tabasco Sauce, no question about it. In fact, whenever a recipe calls for jalapenos, my brain just automatically substitutes this. 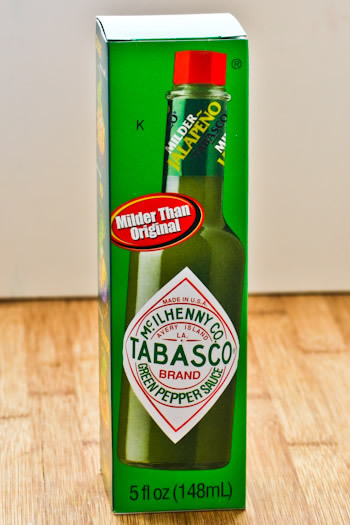 I love green Tabasco sauce because it’s so perfectly flavorful in addition to adding heat, and I’ve been using this slightly spicy sauce for years on eggs, on taco salad, and in numerous recipes, so it’s long overdue for me to choose it as one of my Kalyn’s Kitchen Picks. Just for kicks, I entered “green Tabasco sauce” into the search box on Kalyn’s Kitchen, and found lots of results for recipes where I’ve used this as an ingredient! Below are ten of my favorite recipes using this spicy condiment, and a few recipes from other bloggers who like it as well.Have you tried this flavorful sauce with just a bit of heat? If so, let us know how you use it, and if you have another favorite hot sauce you think everyone should try, let us know about that in the comments as well! All products featured for Kalyn’s Kitchen Picks are things I use in my own kitchen that I would happily purchase over and over. Nearly all the products featured are items I purchased myself; when I occasionally (rarely) have featured a product that was sent to me for review, I always mention that I first tried the product when I received it as a sample. Because I want readers to trust my recommendations, I stopped accepting sample products back in the early days of my blog. I make egg salad with a dozen eggs, miracle whip, green onions, celery, and a whole small bottle of the green Tobasco sauce. Love it! Oh I LOVE the sound of that Lizzie! Kate, same here. I think the green kind has such good flavor. I'm not a fan of regular Tabasco but I do love the green kind! I like it on eggs and on pretty much everything from Chipotle! I've been disappointed in fresh jalapenos. What makes it to the markets in NH barely has any taste. This looks like the easy way out for us heat-deprived New Englanders. Margot, it's made in Louisiana, so it may not be available in Europe. Diana, I think that's exactly how I started using it! Thanks for the tip for using this in place of jalapenos. This would be handy whenever I'm in a hurry…or just want to avoid chopping jalapenos. Hi Kalyn, I must admit I have never seen it in UK… I must take closer look at shelf with sauces next time I'm in the shop, sounds like a great addition to eggs. Wow, so the green Tabasco might have been a fall-back sauce. So glad that happened! I believe there was a period when the McIlhenny Co. was having trouble procuring the true red tabasco peppers, and thought: Uh-oh. We better lure customers into a new flavor sensation, a whole new color. I think it's sensational. I love the green sauce- anything verde is delicious. I use it on eggs, and on rice dishes. It also adds kick to anything rolled up in a tortilla. You know, I've never tried the green Tabasco Sauce. But I am a big fan of Tabasco in general…despite being an even bigger fan of Frank's Red Hot Sauce (which is particularly good on baked wings). Why do I not have this in my pantry full of condiments? I'm putting this on my grocery list right away. The other condiments can squeeze over to make a little room. I have never tried the Green Tabasco Sauce, though I love Sriracha….so I'm wondering: how do the two compare heat-wise? I knew I couldn't be the only one who liked this yummy sauce, but I am really chuckling at the idea of a gallon jug of this for a Christmas gift! This is a regular in my refrigerator! My family likes things hotter than I do, but all of us like the green tabasco. I adore green tabasco! So much so that my husband bought me a gallon jug of it for Christmas one year. I love to use it as salad dressing on Mexican-inspired salads with grilled chicken and black beans. Delicious! Love this sauce and love the recipe roundup!! I looooooove Sriracha sauce, but I do like the green tobasco as well. There's also a green habanero sauce that my local mexican restaurant has that's out of this world. I haven't tried the green sauce. I will have to pick up a bottle. My favorite "go-to" hot sauce is Frank's Red Hot Sauce. I like the kick that it gives scrambled eggs, the punch that it puts in a low-sugar BBQ sauce, etc. It's not too hot for my tastes. I used to buy the small bottle, but now, I go for the big one! I always have red and green tabasco in my pantry!